You are invited to read two books by Joseph Howell. The first is Hard Living on Clay Street, published by Doubleday in 1973 and still in print today (Waveland Press). The book is about the day-in, day-out lives of white, working class families trying to survive. The third edition came out about a year ago with a new Introduction and Epilogue and an endorsement on the cover by Joan C. Williams, “If you want to understand why Trump got elected, read this book.” The book is available on Amazon.com. Washington, DC – Coming from the success of his best-selling book, Hard Living on Clay Street: Portraits of Blue Collar Families, author Joseph Howell is back with another stirring read as he offers an eye-opening account of struggling and battling against social injustice, with his rare view of the civil rights movement through a white man’s eyes. 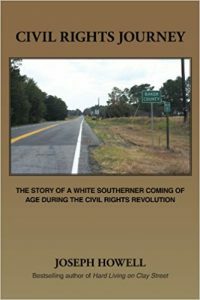 In Civil Rights Journey: The Story of a White Southerner Coming of Age during the Civil Rights Revolution, Howell provides a different story, unlike other books and memoirs of the civil rights movement, with his own version of how a young white man is shaped by the crucibles of polio and segregation and later by that of the civil rights movement. This book is available online and can be purchased at Amazon.com and BarnesandNoble.com. 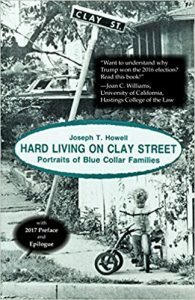 Joseph Howell is also the author of “Hard Living on Clay Street: Portraits of Blue Collar Families”, a book in continuous print since 1973. He has been a consultant in the development of affordable and seniors housing and taught at the George Washington University and the University of Maryland. He lives in Washington, D.C., with his wife, Embry, a health policy researcher at the Urban Institute. They have two grown children and four grandchildren.